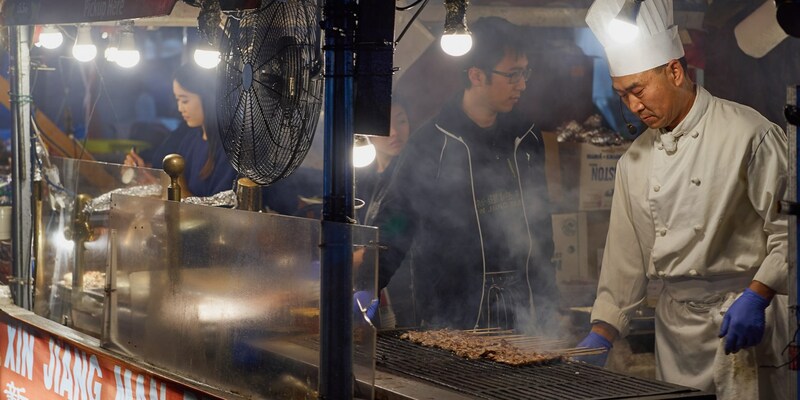 From the beloved char siu pork and roasted ducks of Hong Kong to the lesser-known cumin-crusted shaokao lamb skewers of Xinjiang, Chinese chefs know how to make some incredible barbecue. Get to know a little bit about this vast nation’s cuisine and the ingredients used to glaze, marinade and sauce its beautiful grilled and roast meats. In China, barbecue (known in Cantonese as siu mei) is big. Often found sizzling away in the streets of its biggest cities or in restaurants dedicated to the art of cooking over fire, it’s a universally loved way of cooking meat. In the UK, the Chinatowns of London and Manchester are home to glass-fronted shops and restaurants with golden ducks and red pork on display, often accompanied by an aroma so enticing, it attracts passers-by like moths to a flame. As people in the UK starts to become more and more aware of the different regional cuisines found across China, we’re also starting to break down the catchall term of ‘Chinese barbecue’ and seeking out specific dishes, techniques and styles from across the vast country. The barbecue you find in Cantonese restaurants will differ from what’s served in the north of the country, while the western part of China is home to a large Muslim population, which means lots of spiced lamb. While you’d struggle to find barbecued starfish (a popular dish in Shandong, a coastal region in east China home to a famous cuisine which has influenced much of northern China) or the grilled freshwater fish beloved in Heilongjiang (a province which borders Russia in the northeast of the country, taking its name from the Heilong River which separates the two nations), restaurants specialising in the food of Sichuan, Xinjiang and Hunan are beginning to join the throngs of Cantonese establishments in the UK. Writing about regional Chinese food – be it barbecue or otherwise – is always tough, as there are always too many variations, local specialities and unknown delicacies to fit into one article. 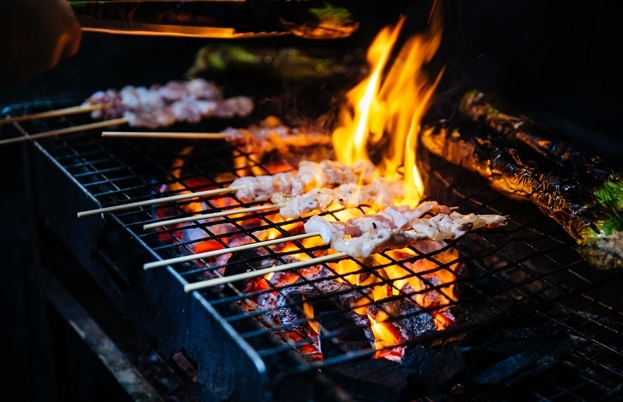 But for a crash course in the country’s most popular dishes and styles of cooking, read on and get a little insight into what makes Chinese barbecue so delicious. First things first – a lot of Chinese barbecue isn’t what we’d call barbecue in the West. While we think of barbecue in terms of glowing charcoal, wood smoke and cooking outdoors, a lot of what is sold as Chinese barbecue is actually roasted in special ovens, with hanging meat being blasted with dry, hot heat until crisp. The fat drips off and vaporises as it hits the oven floor, giving the meat that smoky, barbecue taste. Also, if you’re buying siu mei in China, it’s often served at room temperature rather than hot, and it’s an everyday food for working people rather than being associated with big get-togethers and occasions like Western barbecues. Saying that, not all Chinese barbecue is cooked in an oven and sold in shop windows. Shaokao (also known as chuanr) is one of the country’s most popular street foods, consisting of meat, fish and vegetables threaded onto skewers and cooked over coals. It’s a particularly popular dish in the north of the country, and in Xinjiang to the west lamb or mutton skewers heavily spiced with cumin are ubiquitous. As a general rule, the vast majority of Chinese barbecue is meat, although in coastal provinces and riverside cities fish is grilled too. Vegetables are less common, and often served alongside meat, but in the West you’re much more likely to find completely vegetarian shaokao skewers consisting of ingredients such as tofu, aubergine and mushrooms. Of course, actually cooking barbecue is only half the battle – it’s the marinades, sauces and other ingredients you pair with the main protein that make it stand out, particularly in Chinese barbecue. 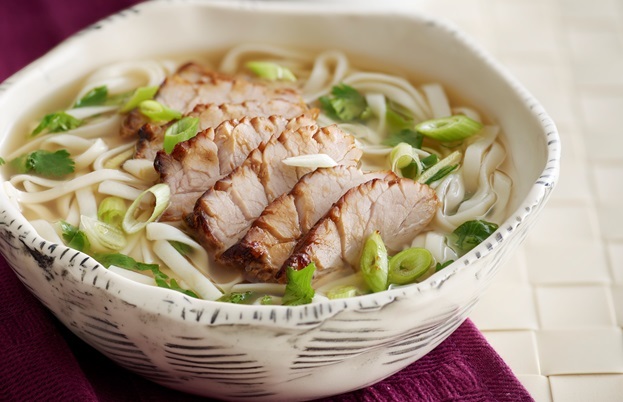 By far the most popular way of preparing Chinese barbecued pork is char siu from Hong Kong, which involves marinating cuts of belly, loin or shoulder in a bright red sauce made with honey, five-spice, soy, hoisin and fermented bean curds (you can also get very good ready-made marinades which save a lot of time when preparing char siu at home). Chicken is often served with a simple soy sauce or a combination of ginger and spring onions, while duck is cooked until crisp and (particularly in the West) served with hoisin sauce. Generally speaking, shaokao skewers from northern and western parts of China will be marinated in light soy sauce, often with plenty of chilli and spices such as cumin to complement the smoked flavour of the meat. Further south – particularly in Cantonese cooking – sweeter and more umami flavours tend to replace the fiery heat of chilli. That means hoisin and oyster sauces are used to bring out the flavour of the meat and fish, with dark soy sauce adding a more prominent punch of saltiness. These methods of amplifying the inherent flavour of barbecued meats aren’t just found in China; they’re replicated across the world. In the US, low-and-slow barbecue often involves rubbing the meat with a mixture of salt, spices and brown sugar, and classic British choices like burgers and sausages are adorned with sweet and tangy ketchup or fiery mustard. As British home cooks start to experiment more and more with international flavours when barbecuing in their back gardens, ingredients like soy sauce, chilli oil, hoisin, oyster sauce and other Chinese standbys provide an easy way to incorporate the flavours of the country’s beloved barbecue with ease.